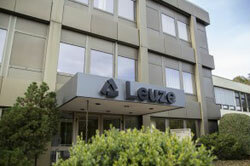 Effective January 1, 2019, Leuze electronic launched its independent sales company, Leuze electronic Deutschland GmbH + Co. KG., as a wholly-owned subsidiary. Owen, January, 11, 2019 – Due to the strong growth over the last few years, the optical sensor manufacturer founded an independent sales company. It was launched as wholly-owned subsidiary of Leuze GmbH + Co. KG effective as of January 1, 2019. "After successfully introducing SAP in the past year, we are taking this important step to allow us to continue to be a strong partner to our customers and offer them the best possible service," says Salvatore Buccheri, Managing Director of the new sales company. As the General Sales Manager for Germany, he has been successfully looking after Leuze electronic's sales in Germany since 2017. The new sales company is located in the immediate vicinity of the manufacturer's headquarters in Owen/Teck, South Germany. Leuze electronic Deutschland GmbH + Co KG took over all sales activities for the territory of the Federal Republic of Germany and entered into all existing supply and service relationships as well as other contractual relationships of Leuze electronic GmbH + Co KG.